Click the image to see it full size. Postcards can be a great source for learning. It was this image of a 1932 Minor that led to a little internet research which uncovered the fascinating story outlined below. The Minor Saloon is about to pass the 1514 Memorial in Hawick, a town located just on the Scot’s side of the Anglo/Scottish border. The following passage has been extracted from the Ken the Horse website: This memorial commemorates the victory of local youths or “callants” from the town over a party of English raiders at Hornshole, just outside Hawick in 1514, most of the men of the town having been killed on Flodden Field the previous year. 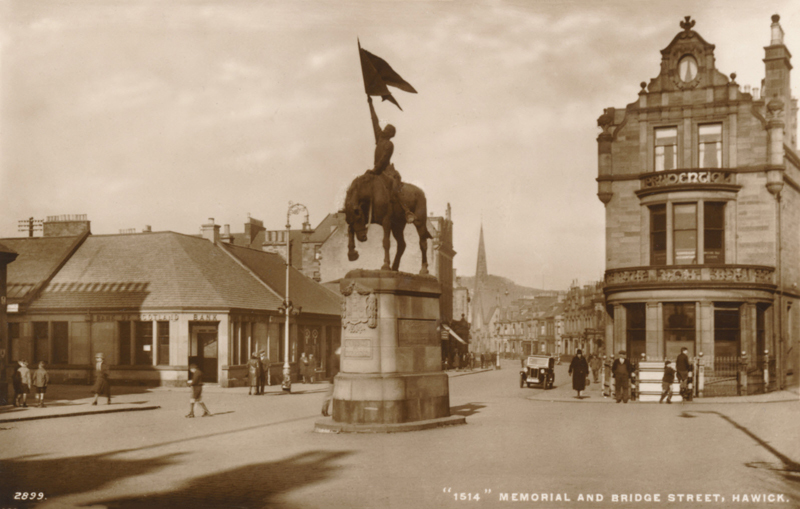 The English flag was captured and carried back to Hawick, the capture of which is commemorated in this proud statue.